We carried out coral trout counts on lots of reefs in the Far North Section of the Great Barrier Reef in 1984 for the Great Barrier Reef Marine Park Authority. This was before any zoning restrictions applied and the entire area was open slather for trawlers and fishers. We surveyed coral trout on some of these reefs again in November 2017 and have been able to compare present coral trout abundance on protected reefs and reefs open to fishing in the Far North with the numbers we recorded in 1984. We divided surveys into inner and outer reefs from both surveys because there are often large differences in fish abundance between these two groups of reefs. 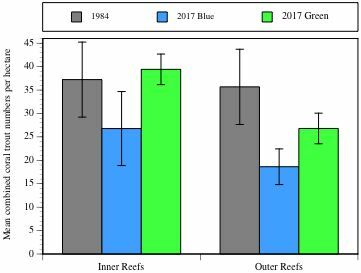 It was intriguing that coral trout abundance in 1984 was equal to or higher on these reefs than in 2017 when the 'green' reefs had supposedly been protected from fishing for 30 years. There are several possible explanations for this. The Far North is a remote area and fishing levels may have been very low prior to marine park zoning and not having a measurable effect on coral trout numbers. This is unlikely to have been the case as at that time the reef fishery was based on filleted, frozen product and many commercial vessels operated in the Far North for at least part of the year. Alternatively, because of the remoteness of the area, present zoning may not be enforced regularly and fishing may presently occur on green reefs as well as on the blue reefs. I was surprised to see small outboard-powered vessels fishing on the outer barrier around Lagoon Reef during this trip and this suggests fishing pressure is relatively high in spite of the remoteness of the region. It is extremely important that we have large areas of the Great Barrier Reef that are securely protected from fishing so that we can build up a pristine stock of large, reproductively active fishes that can seed fished areas with plenty of fish larvae. Studies have shown that a disproportionately large percentage of the fish larvae that settle on fished reefs have come from protected reefs. Blue reefs are open to fishing and green reefs are theoretically protected. All reefs open to fishing in 1984.